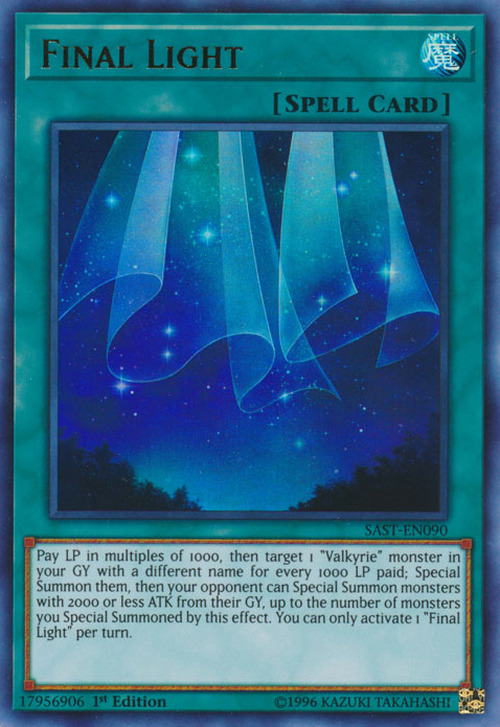 Pay LP in multiples of 1000, then target 1 "Valkyrie" monster in your GY with a different name for every 1000 LP paid. Special Summon them, then your opponent can Special Summon monsters with 2000 or less ATK from their GY, up to the number of monsters you Special Summoned by this effect. You can only active 1 "Final Light" per turn. This card's artwork is very similar to Aurora Draw. This card's Japanese contains 終幕, which can also mean curtain fall, which may be why its artwork shows what appears to be a curtain.